Highland Memorial Park has over 10,000 graves available. Graves are available in any number or arrangement that your family might need. Graves may be purchased with no interest financing for a period of up to 3 years in some cases. Please contact our office for details. The price of the graves depends on the location within the cemetery. Older sections tend to cost more; newer sections tend to cost less. The current range of prices for graves is $1355 to $2050. These prices include a 15% Endowment Care Fee which is required by the State of Wisconsin. The entire cemetery is given uniform care. This is the only fee that is charged for the maintenance of the graves. 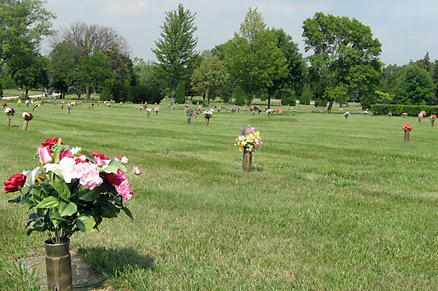 The purchase of a grave allows you the option of placing up to two (2) burials per grave, provided that at least one (1) of the burials is of Cremated Remains or of an Infant.